A newly discovered, diminutive – by T. rex standards – relative of the tyrant king of dinosaurs reveals crucial new information about when and how T. rex came to rule the North American roost. 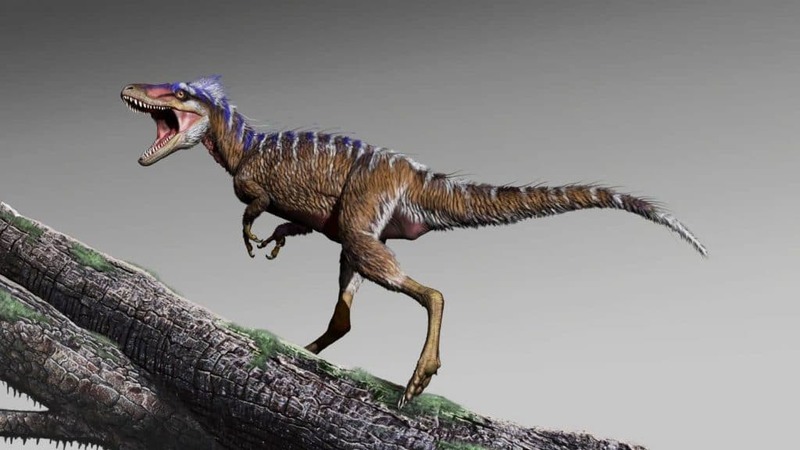 Meet Moros intrepidus, a small tyrannosaur who lived about 96 million years ago in the lush, deltaic environment of what is now Utah during the Cretaceous period. The tyrannosaur, whose name means “harbinger of doom,” is the oldest Cretaceous tyrannosaur species yet discovered in North America, narrowing a 70-million-year gap in the fossil record of tyrant dinosaurs on the continent. That’s exactly what Zanno and her team did. A decade spent hunting for dinosaur remains within rocks deposited at the dawn of the Late Cretaceous finally yielded teeth and a hind limb from the new tyrannosaur. In fact, the lower leg bones of Moros were discovered in the same area where Zanno had previously found Siats meekerorum, a giant meat-eating carcharodontosaur that lived during the same period. Moros is tiny by comparison – standing only three or four feet tall at the hip, about the size of a modern mule deer. Zanno estimates that the Moros was over seven years old when it died, and that it was nearly full-grown. But don’t let the size fool you. “Moros was lightweight and exceptionally fast,” Zanno says. “These adaptations, together with advanced sensory capabilities, are the mark of a formidable predator. It could easily have run down prey, while avoiding confrontation with the top predators of the day. The research appears in Communications Biology, and was supported in part by Canyonlands Natural History Association. Lecturer Terry Gates, postdoctoral research scholar Aurore Canoville and graduate student Haviv Avrahami from NC State, as well as the Field Museum’s Peter Makovicky and Ryan Tucker from Stellenbosch University, contributed to the work. To date, eco-evolutionary dynamics in the ascent of tyrannosauroids to top predator roles have been obscured by a 70-million-year gap in the North American (NA) record. Here we report discovery of the oldest Cretaceous NA tyrannosauroid, extending the lineage by ~15 million years. The new taxon—Moros intrepidus gen. et sp. nov.—is represented by a hind limb from an individual nearing skeletal maturity at 6–7 years. With a ~ 1.2-m limb length and 78 kg mass, M. intrepidus ranks among the smallest Cretaceous tyrannosauroids, restricting the window for rapid mass increases preceding the appearance of colossal eutyrannosaurs. Phylogenetic affinity with Asian taxa supports transcontinental interchange as the means by which iconic biotas of the terminal Cretaceous were established in NA. The unexpectedly diminutive and highly cursorial bauplan of NA’s earliest Cretaceous tyrannosauroids reveals an evolutionary strategy reliant on speed and small size during their prolonged stint as marginal predators.